Raffaldini Vineyards is a first generation Italian family-owned winery and vineyard nestled in the Yadkin Valley Region of North Carolina. Known as Chianti in the Carolinas, Raffaldini Vineyards’ quality-focused winemaking philosophy yields full-bodied, dry, Italian-style red wines from lesser-known varietals such as Sangiovese, Montepulciano, Sagrantino and Nero d’Avola. Crisp, aromatic, and complex white wines round out the tasting lineup with Vermentino and Pinot Grigio. Pinot Grigio – Pinot Grigio is known for its dryness, crispness and acidity, giving the wine tremendous mouth-watering appeal. Rich, tart apple and pear flavors make Pinot Grigio the perfect complement to seafood. Girasole – Girasole, which translates from the Italian as Sunflower, is a dry rosé made using the centuries-old method of pulling free run juice from sun-drenched Sangiovese and Montepulciano grapes after a brief period of skin contact. Girasole reveals layers of complex aroma loaded with fresh, crushed raspberries, strawberries, black cherry candy and dry, almost dusty minerality. Bella Misto – Bella Misto roughly translates from the Italian as “Beautiful Mix.” Bella Misto is a blend of eight grapes, led by our Montepulciano, Sangiovese and Petit Verdot to produce a wine of dense color and a fleshy texture. Montepulciano – Montepulciano presents a wine with deep color and intense fruit aromas with hints of savory spice. Using the traditional Italian method of appassimento, which involves drying the fruit prior to fermentation, enhances the grapes’ inherent fruity characteristics and full body. Sangiovese Riserva – Sangiovese is the flagship red varietal of Italy and is known for attaining worldwide distinction in the communes of Chianti and Montalcino. Ripe cherry and earth flavors are enhanced by Appassimento technique while the Sangiovese’s trademark acidity primes the palate for classic Italian cuisine. Montepulciano Riserva – Montepulciano Riserva is sourced exclusively from our oldest and highest altitude vineyard block. 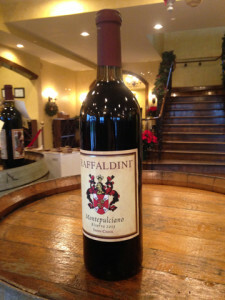 Raffaldini Vineyards’ Montepulciano Riserva is intensified with the grape’s inherent plum fruit and savory spice flavors resulting in a profound wine that is sure to please the red wine drinker’s palate. La Dolce Vita – La Dolce Vita boasts intense aromas of floral lychee, orange peel and cardamom. Made like a smooth and sweet Moscato d’Asti, this is a juicy explosion of fruit like biting int ripe kiwi or plump peaches.